New Holland Agriculture presented its methane powered concept agricultural tractor at the Farm Progress Show in Decatur, Illinois this week. It was introduced as the latest development in the company’s vision for the sustainable future of farming. 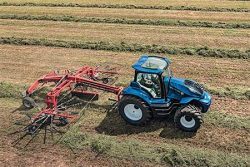 “It combines alternative fuels and advanced agricultural technology … by running on the energy produced from the land and waste products,” said Carlo Lambro, New Holland Agriculture Brand President. The new natural gas powered tractor builds on the foundations of previous T6 Methane Power prototypes, the first of which was introduced in 2013. It features a powertrain that uses a groundbreaking combustion technology specifically developed for agriculture applications by FPT Industrial, a brand of CNH Industrial that has pioneered natural gas traction for more than 20 years. 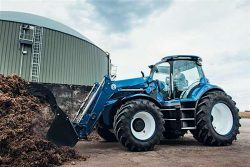 In real field conditions, the methane powered concept tractor produces at least 10% lower CO2 emissions and reduces overall emissions by 80% compared to a standard diesel tractor. 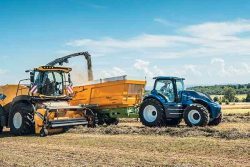 Its environmental performance further improves when fuelled by biomethane (renewable natural gas) produced from crop residues and waste from farm-grown energy crops, which results in virtually zero CO2 emissions.